Well at least Anaheim is correct. CBS had their first March Madness Bracket Preview show and it was a typical preview show. With a little less than six weeks until the Men’s NCAA tournament, they revealed the top 16 seeds in the tournament split in each of the four regional brackets. It wasn’t a surprise that the four top seeds include Duke, Tennessee, Virginia and Gonzaga. And while these seeds aren’t set in stone, it’s a measurement of where the top teams stand entering the last part of the regular season and the conference tournaments. Seeding the tournament involves a lot of factors and one of them is location. For a top seed, a reward is typically enjoying minimal travel for the team and its fans. And while some teams get to be closer than others, the top seeds ideally don’t have to travel too far throughout the month. 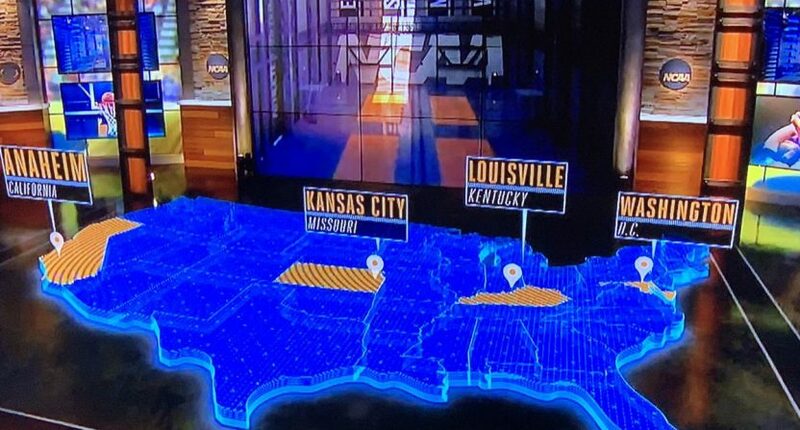 Because of that, CBS mapped out the regional final locations for each of the brackets. But if you look a little closer at the map, it was enough to make a Geography teacher shed a tear. CBS, well the person who created that map, got a solid 50% on this Geography pop quiz. You can argue that they only got Anaheim correct because Louisville’s pin looks like it’s in Indiana but they got the state right and the city is on the state line so I’ll give them the benefit of the doubt. But their two egregious mistakes come from locating two of the cities in different states. First, Washington D.C. isn’t in Maryland. It’s its own district and not involved with any state. It also looks like the pin is in Baltimore but like Louisville, I’ll give them the benefit of the doubt. The next mistake deals with Kansas City. This seems to trip up many but Kansas City is in two states, Kansas and Missouri. Take it from someone who used to live in KC, most sports activities take place on the Missouri side and that includes the site of the basketball games, Sprint Center. NASCAR and soccer is on the Kansas side while football, baseball and basketball is on the Missouri side. So technically, CBS was correct in pointing out Kansas City, KS but wrong as the games are in Missouri. But just like the teams, CBS has about six weeks to smooth out the errors before March Madness starts.